Here's our day-to-day itinerary in Norway for a 14 day road-trip. We hiked, camped and drove through some of the beautiful sceneries we've ever seen. We went in summer 2018, from late Aug - mid Sep.
Drive from Telemark to Lysebotn on the eastern end of Lysefjord. This campsite location was stunning, right next to a waterfall with great views of Lysefjord. I couldn't ask for more even if I tried. This was a crowded campsite. We got lucky because we came early and snagged a water-facing premium spot. 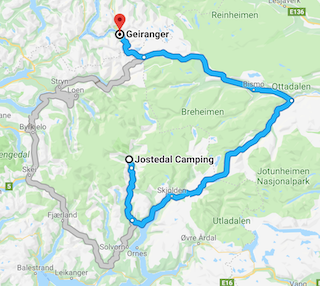 There are two ways to get to Geirangerfjord from Jostedal, but we chose we go through the National Tourist Route based on recommendation we got from other travelers at one of the campsites. It was amazing, and well-worth the drive, see details here R55 Route - Luster. What do you think of the itinerary, was there anything I missed seeing? What will you explore when you go to Norway? Let me know your thoughts in comments below.